Rare Opportunity: Daily Music Therapy for a WEEK! As music is such a powerful tool to open doors of communication, access emotions and to motivate change, great improvements are often seen in clients who receive music therapy once a week. 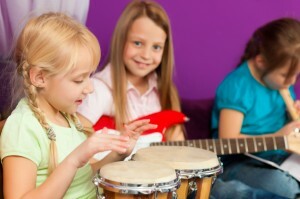 However, what if a client receives music therapy more than once a week, maybe for five days in a row? Meaningful themes such as; Magnificient Me, My Body’s Special, If You’re Happy or Grumpy, My Place in the World, My Community are explored through fun activities with a non-musical purpose behind them. Campers are given opportunities to work on social skills, communication skills, to increase their self esteem and to explore and deepen their love of music. Parents have also indicated JBMT summer camps have helped their child with transitions, turn taking skills and that post camp their child was calm and happy. At the end of the week, we invite parents, caregivers, family members and friends to attend a musical performance, view campers artwork and share pictures of the week. We run camps for preschoolers, elementary children and teens with special needs. As we allow a maximum of 10 campers in each camp, space is limited. Register Now!